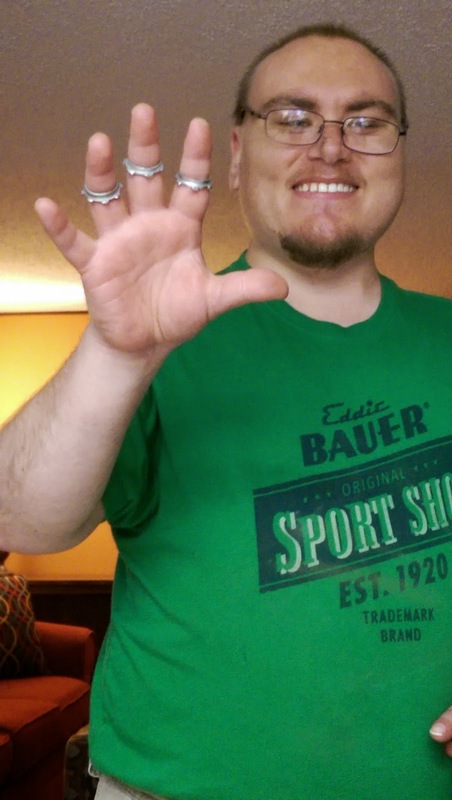 May 2015 – He Said What?! For some reason, whenever I take Aaron to Subway, I find that it’s quite an experience. Actually, I’m the one having the experiences as I watch Aaron and listen to Aaron and try to hush Aaron and so forth. What is it with Subway? Maybe because it takes so long to order there if anyone is in front of us, and if Aaron has time on his hands, there’s no telling what will happen. Aaron told me after one of our trips, when he was with Zach, that they had gotten a sub at Subway. “Subway is a nutritious food area,” he told me. So earlier this week he asked me if we could have a sub on Friday night, and I told him that we would do this if he had a good week. 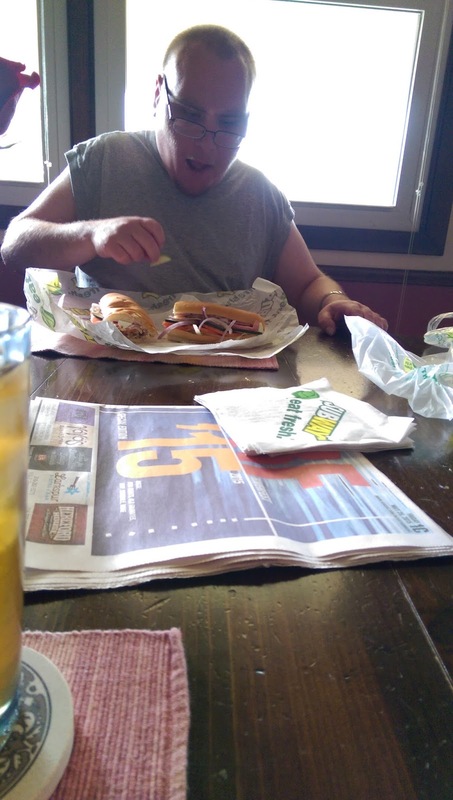 So seeing that he had a good week, and seeing that Aaron never forgets any prospect of food, he and I were off to Subway shortly after he came home today. I was hoping we were early enough to be there alone, with no one in front of us. No such luck. There was a mom with two children already there, just placing their orders. I told Aaron to slow down, that we would have to wait our turn, and I gave him the usual “Shhh” sign as he began talking loudly. It took several “shhhh’s” before he finally halfway whispered. I was trying to get Aaron to go ahead and tell me the kind of bread he wanted, and the kind of sub, but he said he wanted to wait until we got up to the counter……meaning that he would take forever to decide as he tried to find a picture to match his sandwich choice, identify the proper bread, talk about the cheese, etc. In order to help locate the exact meat he wanted, he started edging closer to the family in front of us, craning his neck to look around their shoulders. I quietly motioned for him to stand back. He doesn’t worry much about other’s personal space and he definitely doesn’t notice their wary stares. I whispered for him to come back and stand beside me, but Aaron didn’t follow my whispering lead at all. “Should I tell them they’re in the way?” he asked in his normal voice…..which is too loud. He also doesn’t notice my looks of frustration or embarrassment. But Aaron was already intent on listening to the mother as she requested the veggies for her sub. “She wants pickles!” Aaron told me, not in a whisper. “Who would want pickles? !” he continued. How many ways can I tell him to hush, I wondered? At this point, Aaron was getting a little frustrated at the wait. He saw another employee behind the counter, but this young man was working on a malfunctioning piece of equipment. “Hello?” Aaron blurted out. So again I told Aaron to be quiet. “I’m trying to get his attention,” Aaron explained, as I explained to him that this young man was not making subs right now. Finally it was our turn. I had already figured out that Aaron wanted ham, but when I let him do the ordering, he just pointed to the meats and said, “I want that one.” Like this poor girl would know which one Aaron wanted? And he hadn’t even told her the bread choice yet. So with some patience from her, and from me, Aaron finally began his order correctly. 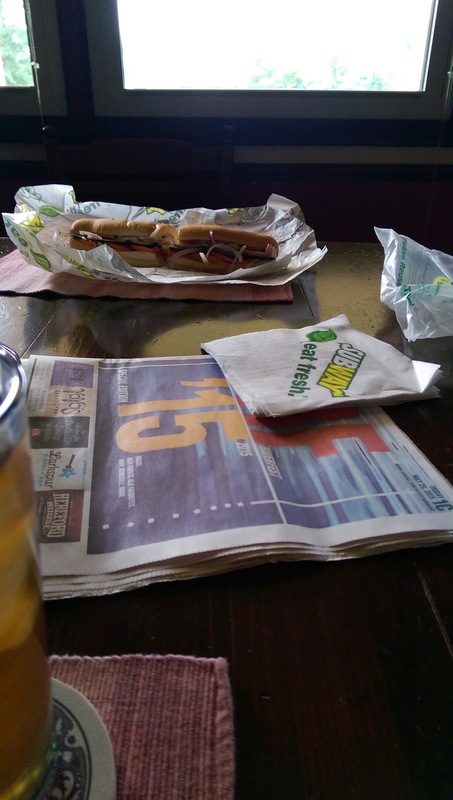 She laid Aaron’s sub aside as she turned to take my order before beginning the veggies. “Wait!” Aaron said. “I want tomatoes and….” he started to say, but I told him to wait. So he tried to be patient as I got Gary’s sub ordered, and then mine. Aaron watched the nice girl spread the Gouda cheese on mine, but he couldn’t resist giving his opinion. “That looks like barf!” he told us. And I was glad that no one was behind us. Aaron finally got to order his veggies, the way he always does. And he told her that he wanted mayonnaise. Yay! He didn’t call it white mustard this time! Aaron decided to whistle then…..a song we had just listened to on the radio. The girl guessed that he was whistling The Lion Sleeps Tonight, which made Aaron very happy and which reminded him that he should tell her about the movie he had been to see today with his day group. “Have you seen San Andreas? !” he excitedly asked her. Except that Aaron pronounces the word “Andreas” the way he says his sister’s name, so it comes out as if he’s talking about San Andrea’s. Our server was confused, but Aaron wasn’t, so he launched right into as many movie details as he could manage while she finished wrapping our sandwiches. He bent over and rubbed his hands together, which only added to the comedy of this whole situation, as he breathlessly told of falling buildings and cracks in the earth and the lines on the earthquake machine going WAY up! I finally got him to quit talking when I told him that he shouldn’t tell her all about the movie before she saw it, and he laughed and agreed and somewhat calmed down as I paid for our subs…..finally. We said goodbye and headed for the door. I thought we were nearly ready to escape as I pushed it open, and then realized that Aaron was not behind me. And there he was, bending over beside the trash can, picking something up off the floor. He sure can move fast for a big guy. I could only imagine what it was that he was now putting in his hand, but as he stood I saw that it was only someone’s receipt. He had already turned and was headed back to the front when I stopped him. “But I thought they wanted it,” he explained as I told him to throw it away. He reluctantly tossed the receipt in the trash, sorry that he couldn’t do a good deed. And probably especially sorry that he couldn’t once again talk to the nice girl who had already listened to far more than she had bargained for, I’m sure. Whew! That was over! And I smiled as I thought of Aaron saying, “Hello?” to the young man behind the counter, and then explaining that he was just trying to get his attention. Little does Aaron know that he doesn’t have to TRY to get anyone’s attention. It comes pretty natural, trust me! Two weeks ago, Gary and I were finishing the last leg of our drive to West Virginia as we traveled home for my mother’s funeral. Has it just been barely over two weeks ago that she breathed her last breath? So much has been packed into this short time that it seems like she left us much longer ago. That’s how my mother lived her life, though. Like my brother said at her funeral, Mom squeezed every bit of opportunity out of each day that she lived. So much was packed into her life…..so much that will impact so many for eternity. As Bob and Jan, and John and Jeanie, planned Mom’s funeral, they incorporated two very sweet and personal elements into the service. Jeanie asked each of the grandchildren to write down their memories of their grandmother. At her funeral, Jimmy read every word that had been written. It was a very moving and sometimes humorous part of the service. 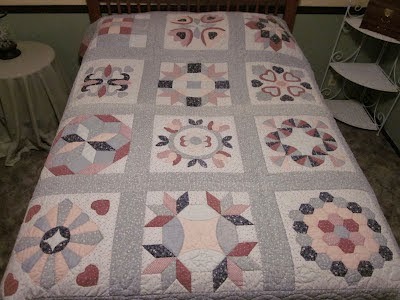 Then Jan asked each of us to bring our quilts that Mom had made us. Each hand stitched quilt that we brought was hung over the railings at the front of the church, adding a beautiful background as we remembered our mother. Something really stood out to me as I listened to the grandchildren’s memories being read. It’s the same thing that I noticed during her visitation at the funeral home the night before her funeral. That night, we stood in line for nearly three hours as person after person hugged us and told us of what our mother had meant to them. Most of their stories were fairly simple. It wasn’t that Mom had done earth shattering acts of great note. She wasn’t interviewed by the newspapers, seen on television, or given big awards for her acts of kindness. 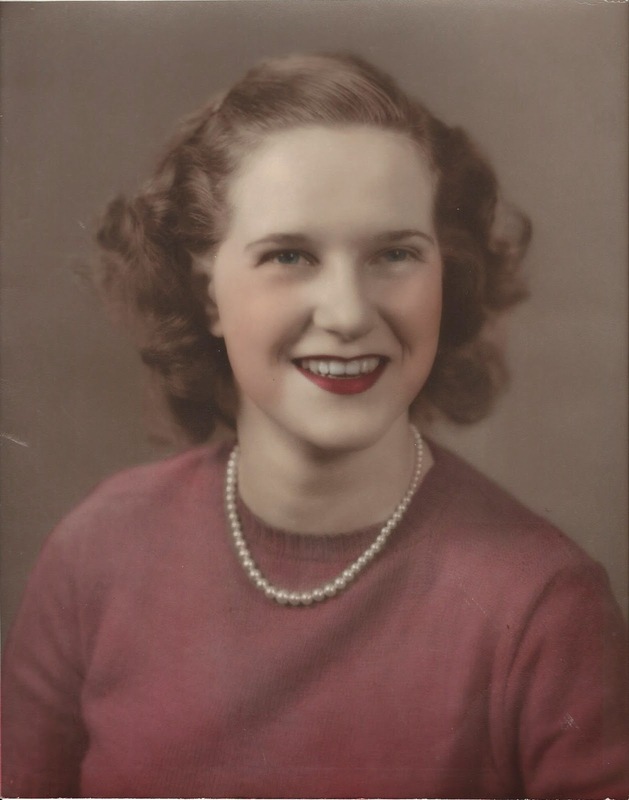 So what did people talk to us about as they shared my mother’s impact on their lives? It was her service to them, her love, expressed in so many ways. 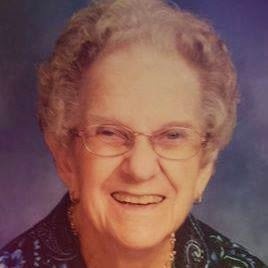 It was meals she cooked, her home she opened to so many, stockings she knitted, clothes she sewed, miniature roses she delivered in Cracker Barrel syrup bottles, boiled custard that she cooked because a friend loved it, sending out missionary prayer letters, making dozens of quilts for others, and so much more. It was her great sense of humor….her ability to lighten any situation with an attitude of light heartedness that was often amazing. It was her word fitly spoken to so many, especially to those who had messed up and made poor decisions. She comforted without judging, and extended help where others might have looked the other way. Story after story we have heard since Mom died. What a balm to our hurting hearts! The grandchildren’s memories were more of the same, on a more personal level. Again, what is striking is that no one mentioned my mother’s education or her job. Not that this isn’t important, because it certainly was a great accomplishment for her to have a Master’s degree and to have a supervisory position with the State Board of Education. Yet with all of her educational goals that she met and with her very responsible job, my mother maintained our home and our family in an incredible way. It was, again, the seemingly small acts that all the grandchildren remembered the most. Guess what was mentioned most often by her grandchildren? It was the Cheerios that she kept in the coffee table drawer in the living room. So many of them talked about that memory and of how much fun it was to go to their house, pull out that drawer as a little child, and eat as many Cheerios as they wanted. Other memories were of the toys, the laughter, sitting on the front porch, all the play time in the yard, her cooking, gardening, sewing, and her unconditional love. It was how she filled her home with joy and filled their lives with personal touches for each grandchild. 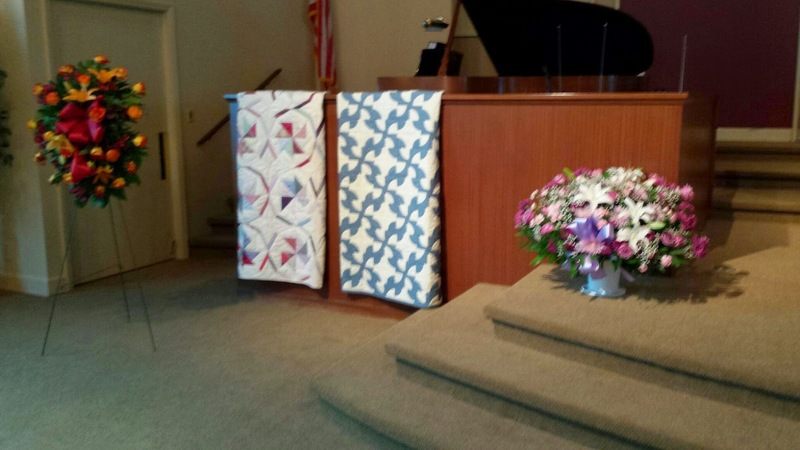 In her memories of her grandmother, Andrea wrote, “I remember how she patiently showed me how she pinned her fabric together in preparation to sew her gorgeous quilts by hand.” As I sat in the church during mother’s funeral service, I looked at the quilts that we had hung on those railings. Each one is full of hundreds of fabric pieces, placed together in way that makes a gorgeous design. When you step back and look at the finished project, you see how each piece combines to make a perfectly beautiful work of art. So it is with the life that Mom lived. Each act of love that was remembered and many that have been forgotten, have all fit together to produce a beautiful life. It’s the handiwork of God in our mother’s life that has blessed and profited so many of us over the 88 years that she lived. Her life was a pattern that I want to follow. A pattern of service and kindness that means more to people that any public acclaim ever will or could produce. I’ll be learning lessons from the design of my mother’s life for the rest of mine, I’m sure. I never know when I hear Aaron burst through the door at the end of his day, as he arrives home from his day group, just what all I will hear or what I will see. He nearly always launches right in to some detail of his day that he just can’t wait to tell me about. Sometimes it’s a funny piece of information. Sometimes it’s about an event that excites Aaron. Sometimes it’s distressing and not so exciting or funny. Sometimes he frustrates me as he tells of something he has said or done that is inappropriate. We certainly never know what a day will hold with Aaron. While I may not know what a day will hold, I do know that often Aaron will be holding something in his hands. Or he will be digging into his pocket for an item that he has found somewhere during his time away from home. I often question how he came upon these various items. Did he really find them? Did he take them when he shouldn’t? One thing for certain is that when Aaron spies something on the ground, especially, he will stuff it in his pocket in a flash. We have had him take lots of items back to Paradigm, his day group. Things we knew that had to belong to someone, or items that he had taken off of Barb’s desk, for instance. Post-it notes…….various cords that belong to devices…….notepads……….highlighters. He found me cleaning his bathroom. 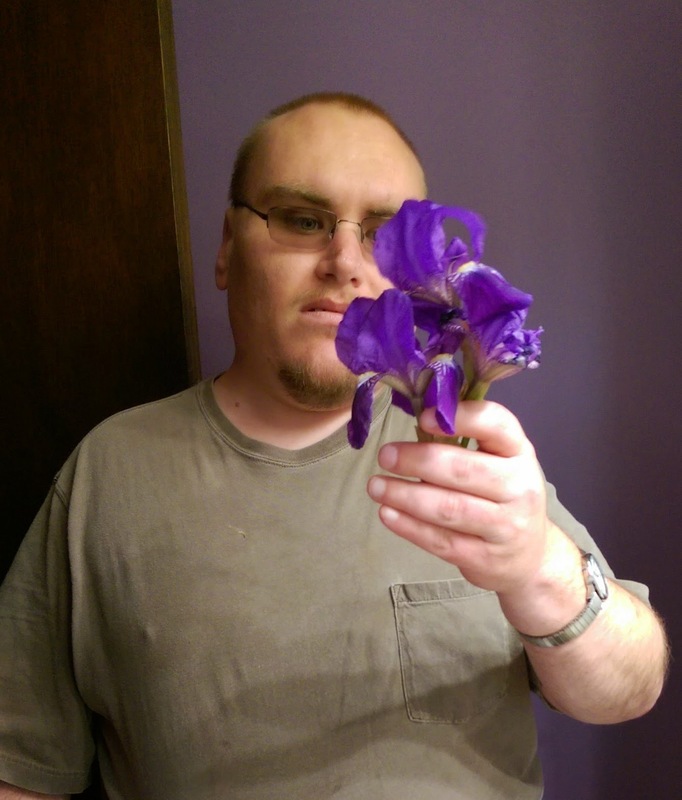 As he walked in the bathroom door, he thrust a flower toward me and unceremoniously said, “Here!” I found myself holding an Iris……a very suspicious Iris…..as I wondered just where he picked it and how much trouble did he get into and who was mad at him for picking their flower. I cautiously thanked him for the flower, and then asked him where he got it. “I tore it off the plant,” he casually answered. Umm, yes Aaron, that’s pretty obvious. What plant? So he told me that there were flowers growing at a house that Paradigm owns…..a residential setting where he often goes with Bryan to work on maintenance issues. And I realized that Bryan knew about Aaron tearing off the plant, and that Aaron didn’t rip it off of some flowers growing outside of a business or whatever, and that maybe it was sort of all right. And what could I do but put it in a glass of water while Aaron proudly watched? He was trying to tell me that he would miss me while I was gone to Houston, so he tore the Iris off the plant for me. It was a mixed blessing, I guess. One that he was quite proud to have accomplished. Thankfully he and Bryan had stopped at a yard sale, so this was a legitimate purchase. So he said…. 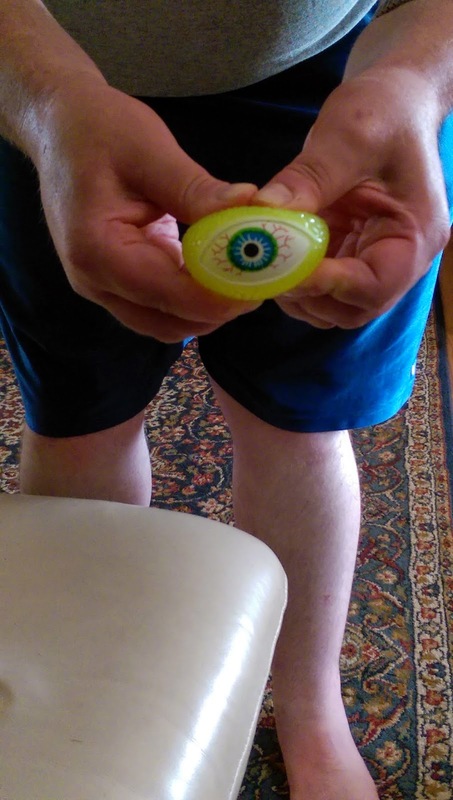 And there was the eye ball. I have no idea who might be missing an eye ball. He finds money. This, thankfully, was on our driveway so I didn’t have to worry about where he got it. We’ve had some behavior issues with Aaron at his day group. It came to a head when I returned home from our trip to attend my mother’s funeral. No time is a good time to deal with these things, but to be forced to handle his emotional needs when mine were so raw was difficult. I made some changes in his transportation, for one thing, and he is much happier. He’s also much happier because of something we never dreamed. “I worked in a place where there were pipes and pipe parts! !” he exclaimed. So of course he picked up some of the pipe parts, slipped them on his fingers, and couldn’t wait to rush home to show me. Then he showed Gary later, repeating the story with gusto. “I like being with Bryan in that place where there are pipes!” he told us. Who would have thought? The next day he happily held up his hands yet again. More pipe parts!! “Bryan is working in that pipe place again!” he said. And there was more! I was thankful that Barb had talked to me on the phone before Aaron got home. 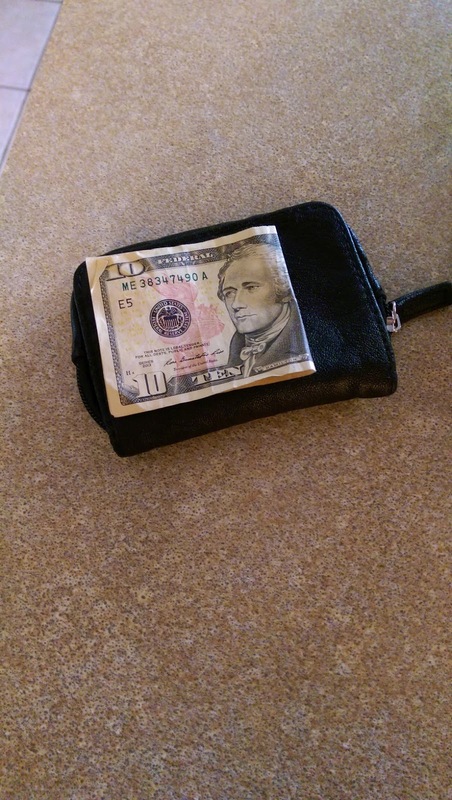 She told me that Aaron would be bringing some money home, and that no, he had not stolen it! HaHa! She knew exactly what I would assume. Paradigm paid Aaron for the hard work he did that day. 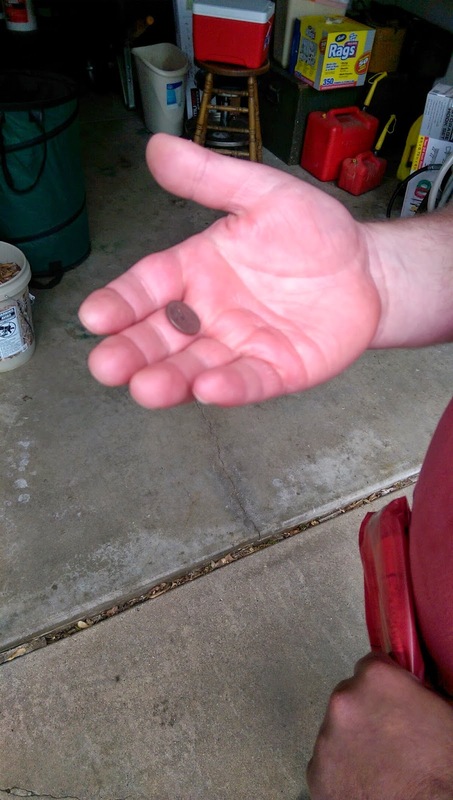 After Aaron held up his fingers full of pipe parts, he dug in his pocket and pulled out some money. It was a $10 bill! He was so proud. He told Andrea all about it later on the phone. You would think he had made a thousand dollars. The effect was just the same, regardless of the money amount. Pride. 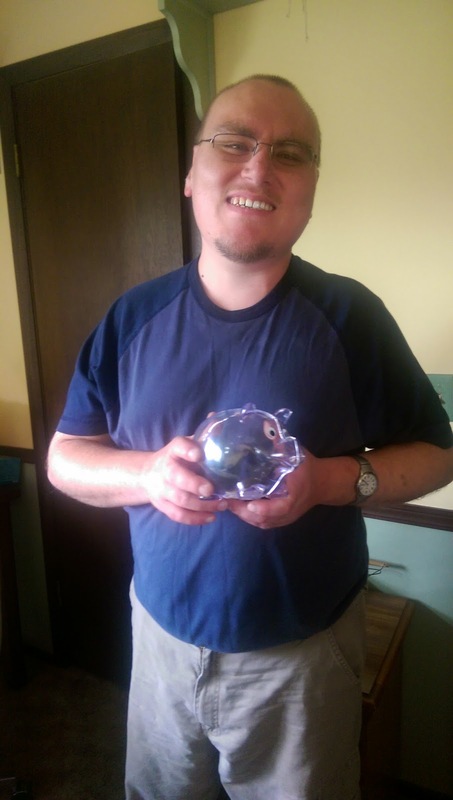 Aaron is proud of the work that he is doing, and proud to be helping in a tangible way. He is proud of the praise he is receiving. And like Andrea said, he feels like an adult who is doing real adult work. Again, who would have thought? But it does make sense, doesn’t it? Aaron has the same needs that we have. He needs to feel worthwhile and productive. 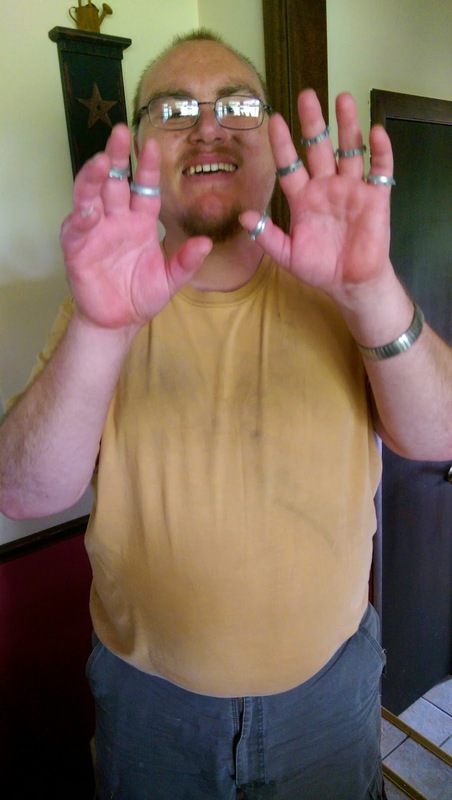 Plus he came home very dirty that day when his fingers were so full of pipe parts. His face and arms were dirty, as were his clothes. He actually agreed to take a shower at that time of day instead of waiting until the following morning. Wonders never cease! Well, what made him seal the decision to take a shower in the late afternoon, totally out of his routine, was this comment that I made. Aaron, if you shower now, you won’t have to shower in the morning. Bingo!! His eyes lit up. “I won’t have to shower in the morning?” he asked in disbelief. No shower when he’s groggy. No shower when we’re in a hurry to leave. No shower when he’d rather drink his coffee and chill on his computer. So far, so good. He has showered before supper for two whole days. He is delighted not to shower in the morning. He is very happy that his money he earned the hard way is safely tucked in an envelope, waiting for season four of Fallen Skies to be bought. I never dreamed that our week which began with Barb and I meeting with Aaron, talking firmly about his options and his choices, would end on such a positive note. Oh, there will be bumps in the road. There will be ups and downs, as always. But honest work and honest rewards are something that Aaron has responded to with genuine joy. I am very thankful for that! Aaron has the same needs that we have. He just doesn’t verbalize them like we do. But those fingers full of pipe parts and that smile on his face tells us all we need to know. It was probably over 55 years ago that a soloist with a beautiful voice went to sing in a revival service in the little town of Oakvale, West Virginia. She sang the hymn “I’d Rather Have Jesus,” and then she sat down to listen to the sermon preached by Jimmie Jones. Her heart was disturbed as she listened to the gospel being preached that night. She thought of the song she had just sung, and of the words that came out of her mouth in such a perfect performance…..words that she knew she didn’t really mean. For it was just that – a performance. She sang beautifully, but she sang a lie. She knew that she didn’t really know Jesus, and that she didn’t really mean it when she sang about wanting Jesus more than anything this world affords. This woman was my mother, and that night changed her life and the life of our family. She went home and urged my dad to go with her to listen to Jimmie Jones preach. Mom didn’t know that my dad had already trusted Christ as his Savior. It wasn’t long before my mother made the same decision. She bowed her head and confessed her sin, and asked Jesus to be Lord of her life. God changed my parents tremendously. 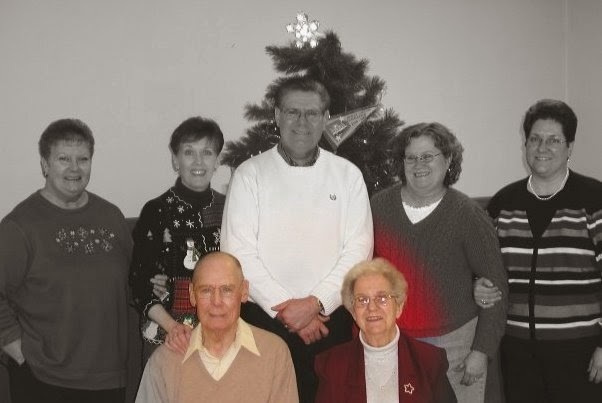 They raised their five children to know and serve the Lord, and they left us a spiritual heritage that has more value than anything this world affords. And “I’d Rather Have Jesus” became my mother’s signature song…..one we heard her sing many, many times over the years. One she sang with honesty for the rest of her life because of the work that God had done in her heart. Last week we said goodbye to my mother for the final time on this earth. We had really lost her a long time ago to the horrible ravages of Alzheimer’s. She no longer had her memories, her personality, or any of her other faculties. But even Alzheimer’s cannot take the Lord away. He has promised to always be with us, and He always keeps His promises. We saw evidences of His presence with Mom as she struggled in various ways. What sweet comfort it brought to know that deep in her heart and her mind, God was ministering to her in ways that we could not. Keeps me singing as I go. My mother was singing! Jan and Bethany wouldn’t have believed it had they not heard it for themselves. She was clearly singing this beautiful old hymn. She was singing about Jesus, whom she was soon to meet. God’s prompting, God’s presence, was there with Mom in that room. Jan and Bethany joined her in singing, and then Bethany said, “I love you.” Mom clearly said, “I love you” to Bethany, her eyes still closed. Then Jan said, “I love you, Mom.” And Mom said, “I love you” to Jan as well. Those were the last words that my mother spoke. The next day the family got the call that she was dying, and on Monday, May 4, my mother met Jesus. Jesus, the sweetest name she knew. Jesus, who filled her every longing. 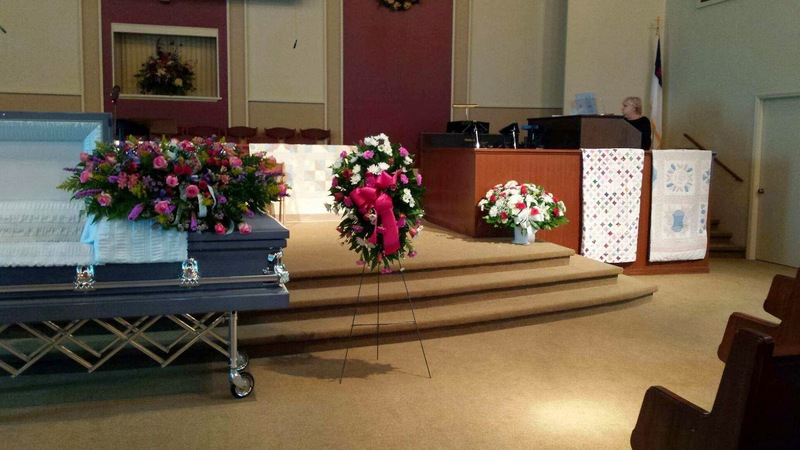 Jesus, who kept her “singing as I go.” Singing as she got ready to go to heaven. Like my brother, John, said at her funeral…..how appropriate that Mom’s walk with the Lord began with a song many years ago. And her life with the Lord ended with a song…..a song that surprised us all, but was such a gift of grace and hope from God. A gift and an example that we will always, always cherish. I’m thinking of my dad today for some very special reasons. It’s been 6 ½ years since he went to heaven after fighting cancer for 8 years. Dad was the one of the godliest men I have ever known. He was so kind, selfless, and loving. He was firm in his faith, never wavering through all the ups and downs of life, including his two bouts with cancer which finally took his life. Yet despite his strong faith and his deep trust in the Lord, Dad seemed to have a great fear of death. None of us looks forward to dying, so on many levels we could understand his dread. As he weakened and the end was coming nearer, he still seemed to struggle more and more with his uncertainties. Finally one evening my brother John spent some time alone with Dad, talking to Dad about what was on his heart. It was during this conversation that John was able to gently lead Dad to really express his concerns about dying. One of Dad’s biggest issues was that he wondered what he would say to Jesus when he first saw Him. We all just smiled and shook our heads when we heard that. There he was again, not worried about his own pain but instead concerned about what he would say to his Lord. And how like Dad that was! He was always the ultimate planner and organizer, so for him to face this uncertain encounter with no plan or idea of what it would be like was very hard for him to handle. Plus it very much showed his humility as he felt completely unworthy to stand before Jesus. Something else that was heavy on my Dad’s heart was the fact that he would be leaving my mother. They had been inseparable during the 22 years of retirement they had enjoyed together. Then when dad was put in a hospital bed, Mom slept in their bed right beside him and they held hands through the rails. 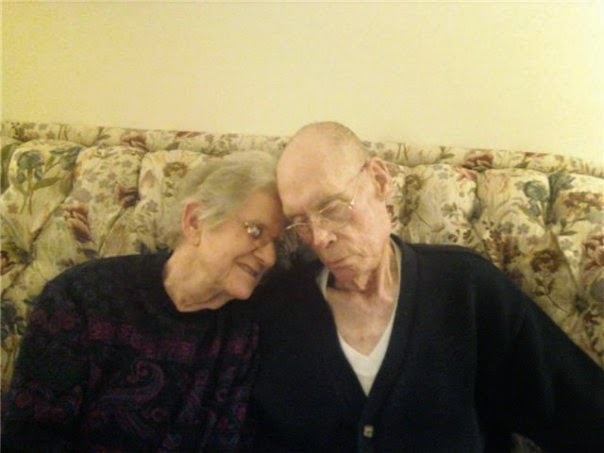 Dad knew that Mom was really showing the signs of Alzheimer’s in ways that we hadn’t seen. He kept trying to find ways to tell us about it without Mom hearing him because he was so worried about what she would do when he was gone, and he wouldn’t be there to help her. Part of his letting go was hearing our words of assurance that Mom would be cared for and that he didn’t need to worry about her. I don’t know that anything comforted Dad more than those words and that thought. Later that night, as Mom and I sat with him in their family room, he very softly and slowly shared that thought with us…..and he sweetly smiled as he said it. His soft, gentle smile….full of the hope that the separation from his Beth wouldn’t be so long after all. We all know it was that night when Dad felt released to go on to heaven. He knew that everything would be all right, and that Mom would join him in the blink of an eye. Several days later he left this earth for heaven. I’m thinking of my Dad today, and definitely my mom, for another very special reason. Today my mother also left this earth for heaven. She and Dad are finally together, whole and healthy at last! 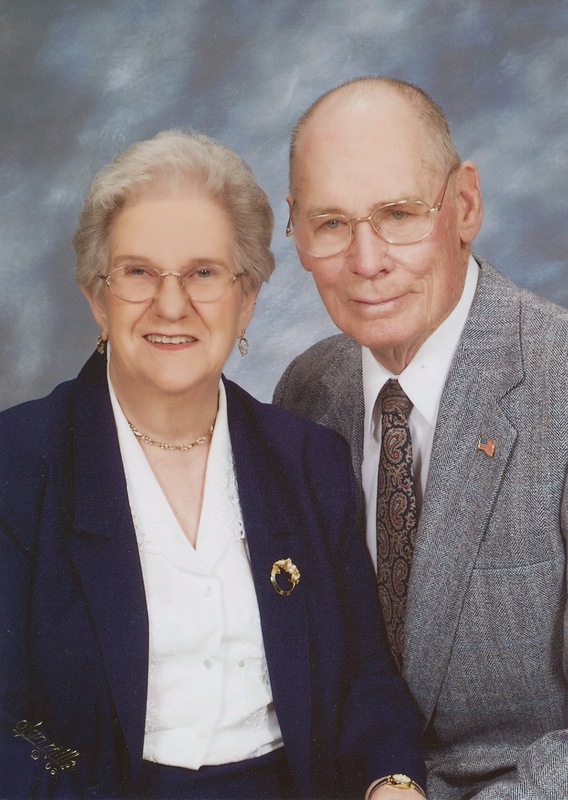 I can’t imagine the joy they’re both experiencing right now to be with Jesus, and to be together for eternity. Jan told me that Mom opened her eyes, eyes that had been shut for days. It was as if she saw something. Then she closed her mouth, closed her eyes, and was gone. Did she see heaven? Did she see Dad, grinning from ear to ear? Did she see her Savior? What precious and awesome thoughts those are! So while we cry at having to say goodbye to our last parent, we can’t help but smile and be so happy for her and for Dad. Oh my goodness, I would love to have seen that reunion! Someday we’ll join them there, and we’ll have so much joy and so much fun. But until then, while we will sometimes weep and we will often miss them both, we can smile at God’s sweet goodness and rejoice over the certain hope we have of life together in heaven. Hey Mom, you and Dad have a great time up there! When we all get there, I do hope the Lord lets us sing “Oh, It Rained, Rained, Rained” again, just to torment dad. We’ll all see you in a couple blinks of an eye.